BuzziBalance by 13&9 for BuzziSpace, has won the ActiveOffice®AWARD certified by Eurocers in the category “Health”. BuzziBalance, an active alternative to static objects that encourages balanced posture and stimulates body and mind activity, beat the competition of products introduced at last year’s ORGATEC. The BuzziBalance family offers both a seating and standing option. While standing, the BuzziBalance Board becomes a muscle activator. As one balances on the wooden-carved rocking board for a few moments, the mind and body are awakened. 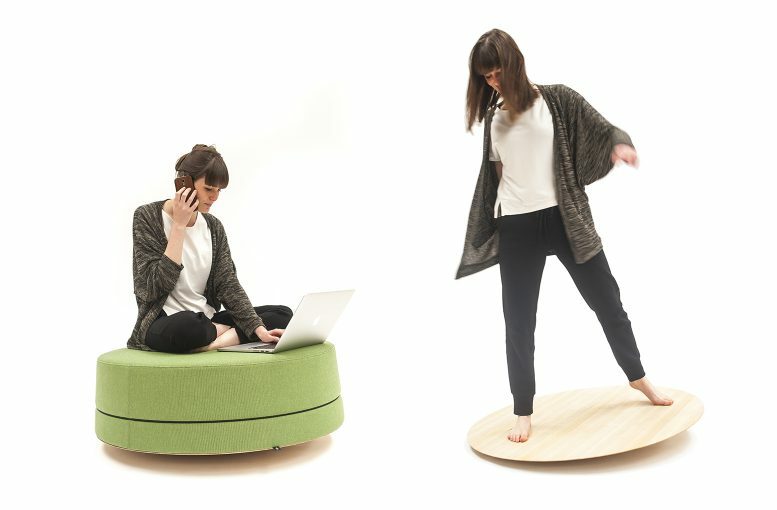 While sitting on the BuzziBalance, a rocking pouf in small and large versions, the benefits of purposeful stretching are brought into the workplace. The upholstered seat also offers added acoustical benefits and is the perfect solution for creative hubs in offices, hospitality spaces or homes. Since its launch at NeoCon in 2016 BuzziBalance has received the Best of NeoCon Gold Award by Contract Magazine in the category “Office Accessories”, a HiP Award Honoree by Interior Design Magazine in the category “Wellbeing” and the prestigious Good Design Awards 2016 by The Chicago Athenaeum International Museum.